Today is an awesome day. Hey, I’m not perfect, but I kinda like myself today. What’s the difference in today and the days I don’t like myself? Beats me…got no clue, but that’s okay. I’m just going to enjoy the day! First thing, got a little confidence in myself and upgraded this to my own personal domain. I guess that makes me a “real” blogger now. The main change will be that my soon-to-be Graphic Designer, BFA graduate daughter can fancy things up a bit and make some improvements to the look of the blog. Next, I just wrote for the first time in a long time on my unearthedart site. I’m going to start making the art cards again. It’s been too long and I need to get busy. And now for today’s topic: I couldn’t get to sleep last night and stumbled upon a blog, dailydeclutter.com – I stayed up wayyyyy too late reading. This guy posted every day about decluttering his life. Every day was a post with a story about what he was getting rid of. Sounds boring, but…he wrote well and it was pretty interesting and really funny at times. Most of the stuff he was getting rid of was stuff I wouldn’t have had in the first place. Getting rid of any of it would have been a no-brainer for me. But, we all have our own struggles and no matter what the crap we are surrounded by, the struggle is real. Why is it all here, where did it come from, what do I do with it, and how do I keep more from coming in? And, as I am coming more and more to realize, the stuff is just a symptom of other problems and issues. My journey continues and I will deal with it all…cause and symptom. Last December was a sort of tipping point for me. I went into the holidays with a lot of family and guests coming in and a lot of clutter and mess already here. I vowed that it was time for the stuff to go…it could no longer be taking up space that should be welcoming those I love. Have I made progress? I think so. In my current, optimistic mood, I’m going to say that I’ve dealt a lot with the root issues in the past 10 months. Am I cured? Have I reached my goal? Not so much. But, I will never become a completely different individual. The issues and problems that I deal with are part of who I am and not always in a bad way. I can change and make progress and become better and I will continue to work towards positive growth. There is no actual destination…it’s a journey! The new game, project, challenge….whatever you wanna call it – is this. Between now and Christmas Day, I will consciously declutter 5 items a day and document it here. I’m always on the look-out for stuff to get rid of, but I’m going to make it a “thing”. I’m going to pay attention to it and share the experience. Probably won’t be as funny as the blog I read through last night, but that’s okay. We’ll see what I can do. Today, finished going through the winter clothing. 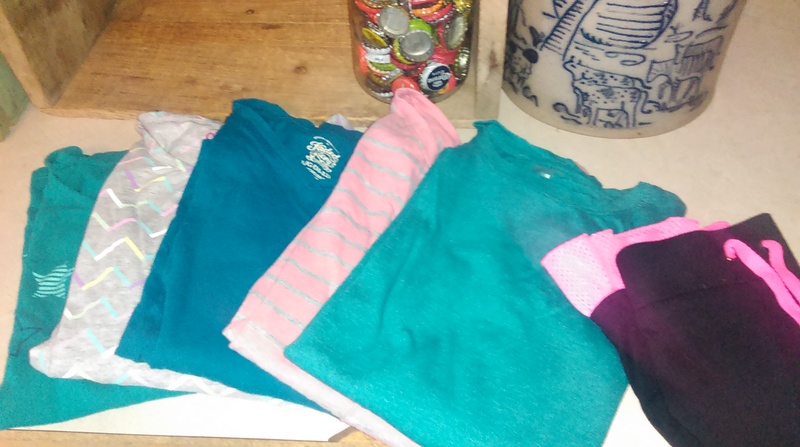 Youngest daughter has grown a lot…five shirts and a skirt that we’ll share with a friend. 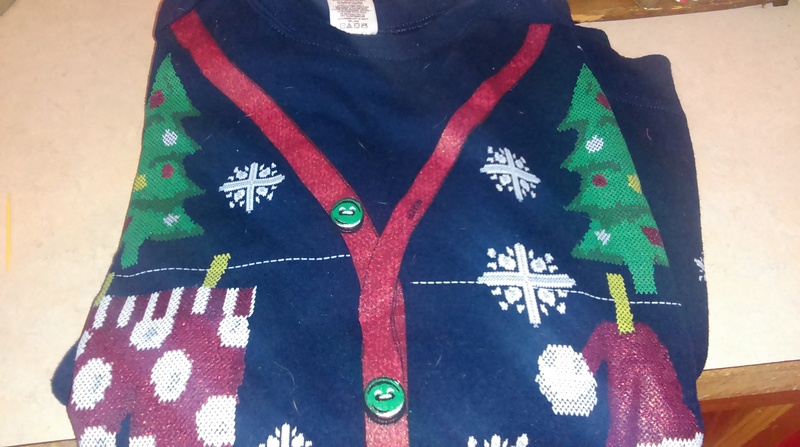 Also gone – a sweatshirt leftover from an ugly sweater dress-up day at work that my son gave to the cause – going to the thrift store. Seven things gone on Day 1. And now since the rain continues and is unlikely to stop anytime soon…I’m going to find a snuggly blanket, a snuggly dog and the company of my hubby and enjoy some Netflix. Then, I’m going to paint and create. And that’s just about the perfect day.